Aretha Franklin, the Grammy Award-winning R&B singer who inspired countless generations of singers and whose powerful, gospel-infused voice earned her the title of Queen of Soul, has died. She was 76. The cause of death was advanced pancreatic cancer, according to the Associated Press. 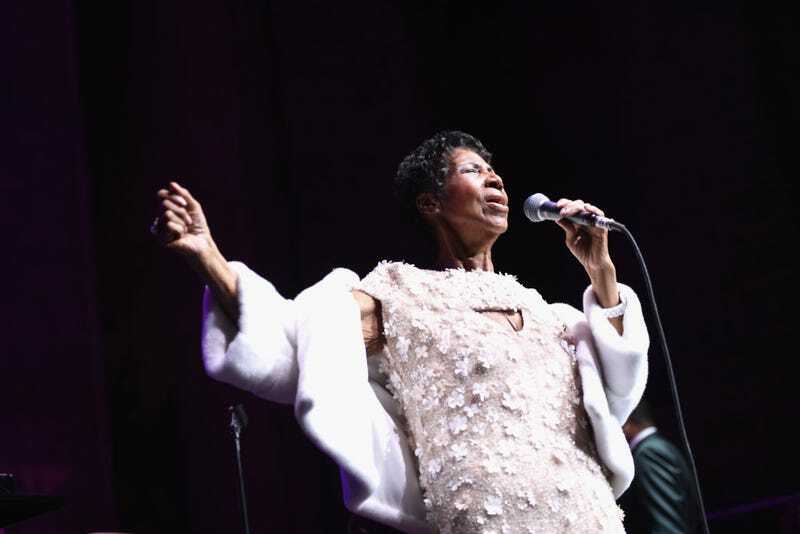 In a family statement to the AP, Franklin’s publicist Gwendolyn Quinn said the legendary singer died Thursday at 9:50 a.m. at her home in Detroit. “In one of the darkest moments of our lives, we are not able to find the appropriate words to express the pain in our heart. We have lost the matriarch and rock of our family. The love she had for her children, grandchildren, nieces, nephews, and cousins knew no bounds,” the family said in the statement. She did undergo surgery in 2010 that caused the legend to lose 85 pounds, but she insisted to Access Hollywood that she didn’t have gastric bypass, but she wouldn’t reveal the details of ailment. “It’s really not necessary to talk about one’s personal medical [health],” she said. She had recently announced her retirement from touring and earlier this year, she canceled two concerts under doctor’s orders to rest before hitting the road, according to Rolling Stone. The voice of a generation, Franklin was named “the greatest singer of all time” by Rolling Stone in 2010. She influenced some of our greatest singers: Whitney Houston, Mary J. Blige, Alicia Keys. Before Aretha, no other female artist made such an artistic and cultural impact. She was the proud, fiery voice of dignity and r-e-s-p-e-c-t for a generation. Everything you needed to know about her—the pain, the joy, the faith, the strength—was etched in every note she sang. Simply put, if you didn’t feel Aretha, you didn’t possess a soul. Aretha Louise Franklin was born on March 25, 1942, in Memphis, Tenn., the third of four born to the Rev. C.L. Franklin and his wife, Barbara Siggers. When Aretha was about six, the family settled in Detroit, where the charismatic Rev. Franklin established a nationally renowned reputation as pastor of New Bethel Baptist Church. Her parents split soon after relocating to Detroit. Siggers then moved to Buffalo, N.Y., where she died when Aretha was 10. At this point, the artist’s talent as a singer and pianist already was apparent, as she sang and played in her father’s church. At 14, Aretha recorded a gospel album—and became a mother. By the time she was 18, she had two sons and a promising recording career as a pop star for Columbia Records in New York. She was signed to the venerable label by John Hammond, who had also signed Billie Holiday to her first recording contract. Aretha languished at Columbia for seven years, releasing scattershot albums that mixed jazz, blues, standards and Tin Pan Alley pop until, in late 1966, she signed with Atlantic Records, the earthy R&B label that launched the likes of Ray Charles and Ruth Brown. It was there, under the guidance of producers Jerry Wexler, Arif Mardin and Tom Dowd, that Aretha became the undisputed Queen of Soul. Between 1967 and 1974, she recorded a string of soul and pop classics that made her an international icon. Those hits include “I Never Loved a Man (The Way I Love You),” her signature “Respect,” which topped the pop and R&B charts in the spring of ‘67, “Chain of Fools,” “(You Make Me Feel Like) A Natural Woman,” “Think,” “Share Your Love With Me” and others. Though heralded for her voice, a clarion instrument with great range, Aretha was also a gifted songwriter. Like so many greats before her, namely Ray Charles and Sam Cooke, she was a master at braiding intense sexual and sacred sentiments in her lyrics. “Spirit in the Dark” is perhaps the finest example of this. Lyrically, she told memorable stories of passion (“Dr. Feelgood” and “Day Dreaming”) and funky good times (“Try Matty’s” and “Rock Steady”). Her skills on the piano were just as soulful and wondrously complex as her vocals. After her pop breakthrough in 1967, Aretha became one of the most celebrated women in pop. She would go on to win 18 Grammys, including a Lifetime Achievement Award, and become the first woman inducted into the Rock and Roll Hall of Fame in 1987. And in August 2012, Franklin was inducted into the GMA Gospel Music Hall of Fame. Her name was synonymous with soul. But Aretha, or “Ree” as longtime fans and friends called her, was adept at jazz (her Columbia sides are woefully underrated), traditional gospel (the 1972 album Amazing Grace is one of the genre’s most important recordings) and blues (she belongs in the pantheon with Bessie Smith and Dinah Washington). In the latter part of her recording career, starting in 1980 when she signed with Arista, Aretha kept up with trends. Her 1998 hit, “A Rose Is Still a Rose,” was produced by hip-hop superstar Lauryn Hill, who emboldened the Queen with a syncopated, streetwise beat ideal for jeeps. Aretha, then 56, sounded refreshed and at home. The single became her last Top 10 hit. Over the last couple of years, Franklin has still been shining in the spotlight. In 2009, she sang “My Country ’Tis of Thee” at President Barack Obama’s first inauguration. And while her performance was stunning, as always, it was her hat—made of gray felt, with a giant bow encrusted with rhinestones—that garnered most of the attention. On September 29, 2014, Franklin received a standing ovation when she performed Adele’s “Rolling in the Deep” on the Late Show with David Letterman. Which led to the cover being released by on Aretha Franklin Sings the Great Diva Classics, October 21, 2014. The song debuted at number 47 on Billboard’s Hot R&B/Hip-Hop Songs chart, which led to Franklin becoming first woman to have 100 songs on the chart. In 2015, Franklin performed at the 2015 Kennedy Center Honors for honoree Carole King, and in the middle of singing “(You Make Me Feel Like) A Natural Woman,” Franklin dropped her fur coat to the stage, and received a standing ovation. One of Franklin’s last performances occurred on Nov. 7, 2017 at the Elton John AIDS Foundation New York Fall Gala. A reticent and private personality offstage, Franklin produced four sons: Edward and Clarence Franklin, Ted White Jr. and Kecalf Cunningham (the latter two are active in the music business), and would marry and divorce twice—remaining friendly with her last husband, actor Glynn Turman. She is also survived by a sister, Carl Ellan Kelley, and a brother, Vaughn Franklin. Rashod Ollison is the entertainment writer at The Virginian-Pilot. He lives in Virginia Beach.